As we progress through Q1 of 2019, let’s look back on 2018 and analyze how funding in the real estate technology (proptech) sector compares to previous years. 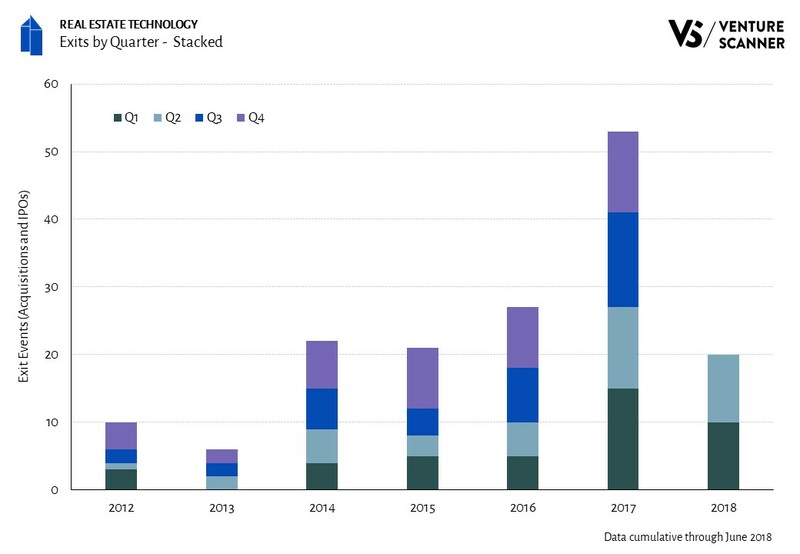 The graphic below shows the total annual real estate technology funding amounts over time. 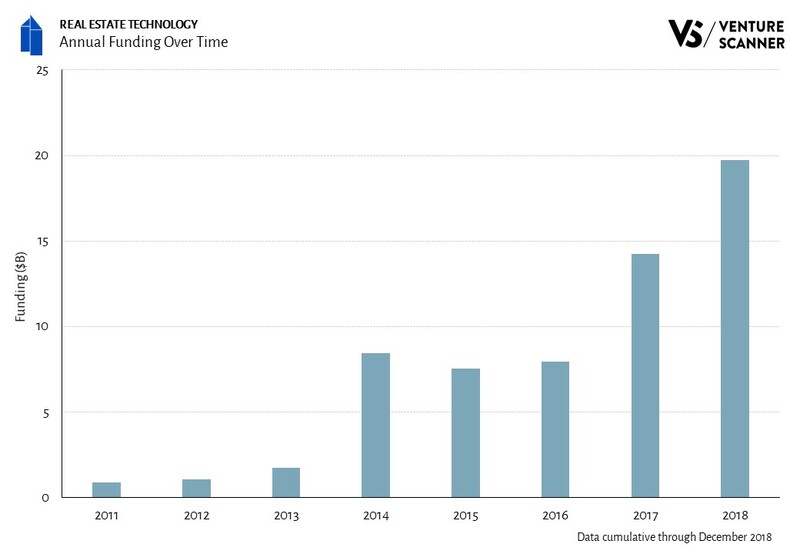 As the graphic demonstrates, 2018 was a record year for real estate technology funding at almost $20B. That represents a 38% increase from the previous year’s funding. In addition, real estate technology funding grew at a CAGR of 62% over the past 5 years. Some of the largest funding events in 2018 include a $3B round for WeWork, a $1.5B round for Lianjia, and a $1.1B round for View. To learn more about our complete real estate technology dynamic report, visit us at www.venturescanner.com or contact us at info@venturescanner.com. The real estate technology (proptech) industry has seen $69B in total all time funding. Let’s examine the investors financing the real estate technology sector and identify the most active firms. The graphic below highlights real estate technology investors based on the number of investments made in the sector. If an investor participates in two investment rounds in the same company (such as a Series A and Series B), that would qualify as two investments for this analysis. As the graphic demonstrates, 500 Startups has made the most investments in the real estate technology sector with 77 investments. Y Combinator follows with 56 investments. Examples of companies that 500 Startups has invested in include Knotel, Kin Insurance, and TaskRabbit. Here is our Q3 2018 summary report on the real estate technology startup sector. The following report includes a sector overview and recent activity. To learn more about our complete real estate technology report and research platform, visit us at www.venturescanner.com or contact info@venturescanner.com. Our latest quarterly update for real estate technology highlighted the most recent activity in the sector. Now, with over half the year complete, we’re performing a mid-year status check on how exits in the space are shaping up. The above graphic shows 20 exits in the first half of 2018. For the past three years, Q3 and Q4 accounted for 57% of total exit events on average. If that trend holds, 2018 exits will finish the year slightly lower than 2017, but higher than 2016. We’ll see if the second half of the year changes this trend! To learn more about our complete real estate technology report and research platform, visit us at www.venturescanner.com or contact us at info@venturescanner.com. We’ll explain these key takeaways with some graphics and discussions below. To start off, let’s review the amount of funding raised this quarter by each category within real estate technology. The above graphic shows that the Commercial Search category leads the sector in Q2 funding with almost $1.1B. Its funding is 40% higher than that in the next category, Home Services at $0.8B. Commercial Search companies comprise of tools that help consumers or businesses find commercial real estate for rent or sale. Examples include shared working spaces and real estate search engines. Some sample companies include Kr Space, RocketSpace, WeWork, and UrWork. 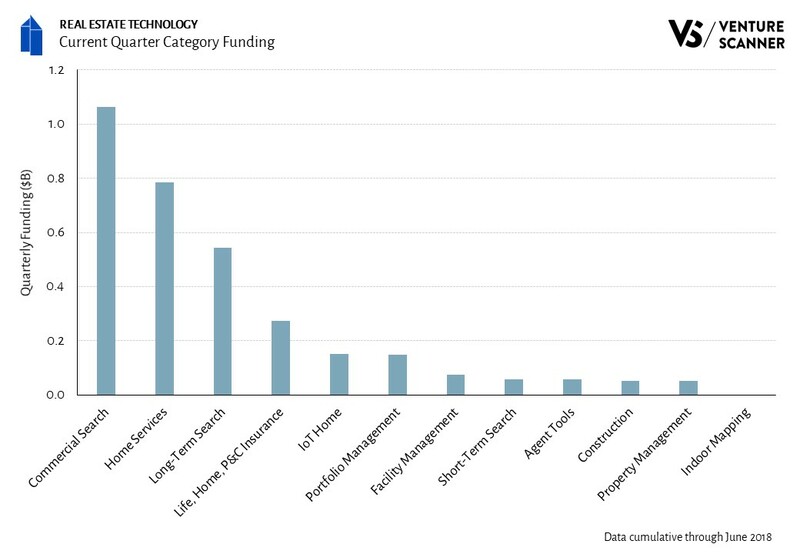 So we’ve observed how different real estate technology categories stack up in their Q2 funding. But how do these categories’ funding compare with each other historically? Let’s investigate that in the next section. 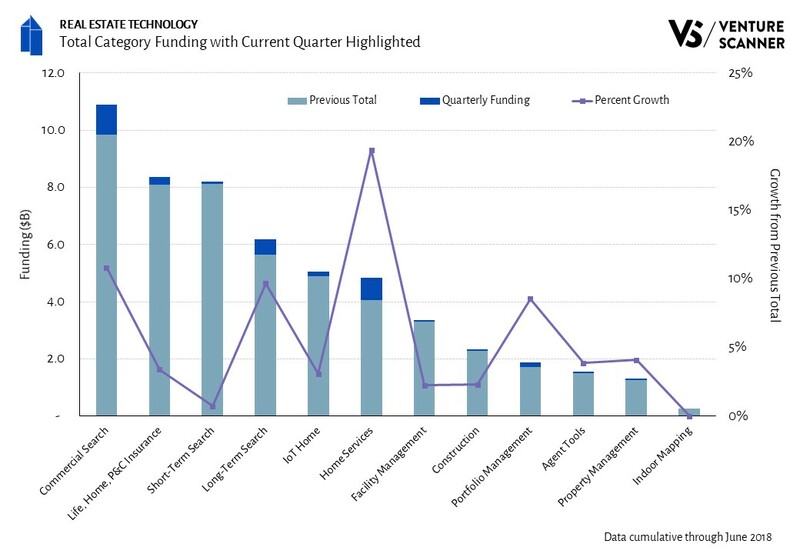 The graph below shows the all-time funding for different real estate technology categories. The Q2 funding and growth rates of these categories are also highlighted. The bar graph indicates that the Commercial Search category also leads the sector in total funding at $11B. This is 30% higher than the funding in the next category–Life, Home, P&C Insurance at $8.4B. In addition, the line graph shows that the Home Services category saw the highest growth rate in Q2 at 19%. The Commercial Search category leads real estate technology in not only Q2 funding but in all-time funding as well. It’ll be interesting to see if any other real estate technology categories catch up in the rest of 2018. Here is our Q2 2018 summary report on the real estate technology startup sector. The following report includes a sector overview and recent activity.